I asked what I could bring to the Easter buffet on Sunday. Dessert! I thought about making a double chocolate cupcake. In Pantelleria cupcakes, as we know them don’t exist, so I thought it would be fun to contribute something that is not typical here. I started to bake. I made up a recipe using really high quality chocolate. I must say they tasted divine … but to pipe the icing and make them look beautiful enough for the photo was another thing completely…holy cow! In my mind I had Magnolia Bakery stylish art piece cupcakes decorated with these nice sugar daffodils (that I brought with me from NY). Not one came out as I had in mind, so we just ate them, Carlo, Igor and me. Carlo was euphorically happy about the fact that I would have to make them again to get them presentable for the blog! I will do them again and practice on my icing skills, in the future. I promise! 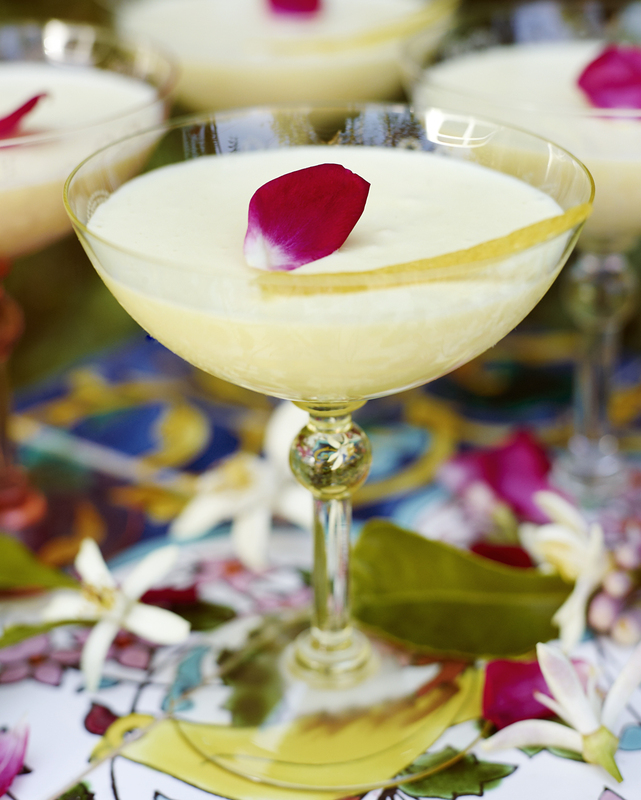 An easier dessert is this Lemon Mousse. It will be perfect to bring to the table on Sunday. With scissors cut the gelatin into uniform pieces and place in the cold water to soak for about 5 minutes or until it has a jelly like consistency. Fill a small pot halfway with water and place on a medium heat. Allow the water to reach a calm boil, then turn the burner down to low heat. This will be the bottom of your double boiler. In a stainless steel bowl that can rest on top of the pot you used to boil water, place the egg yolks and sugar. Whisk as to combine the contents thoroughly. Place this mixture on top of the water in the small pot and begin to whisk vigorously allowing them to become fluffy and cook but not to the point of scrambled eggs. Should the scramble occur, don’t panic. Add a teaspoon of cold water to the egg and sugar mixture and whisk again. The egg mixture will return to fluffy. Set aside. Dump the water from the pot and add the gelatin, lemon juice, and zests over a low heat with a spoon stirring constantly melt the gelatin. When it has melted, remove from the heat and fold into the egg yolk and sugar mixture. Whip with a hand mixer the heavy cream until it forms stiff peaks. Fold lemon gelatin mixture and whipped heavy cream together. Cover each glass with plastic wrap, then place them on a shelf in the refrigerator. Allow to set for at least one hour. This entry was posted in Dessert Recipes, Holiday Recipes and tagged Anna Huerta, dessert, dolce, lemon, lemon mousse, lemon tree, Pantelleria, Sicily on March 28, 2013 by Anna Huerta. 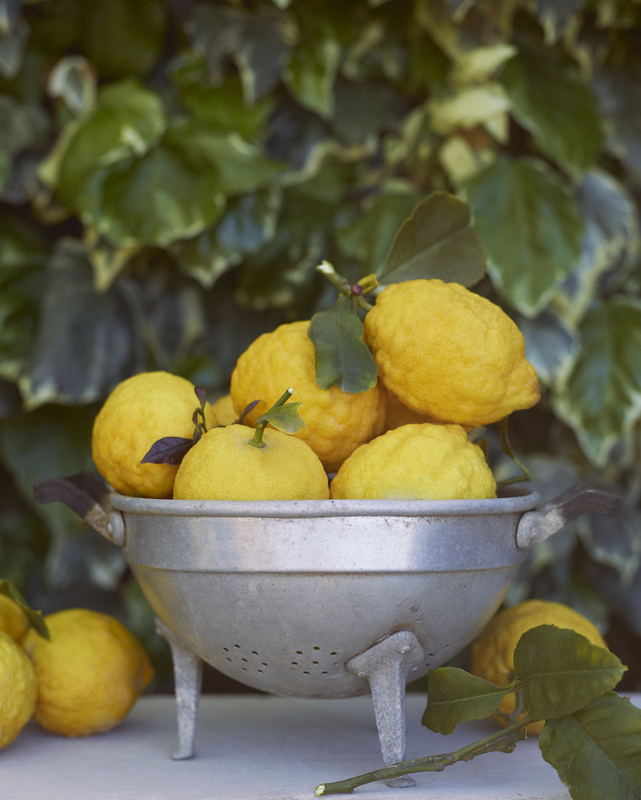 I’m happy it is still lemon season in Pantelleria. 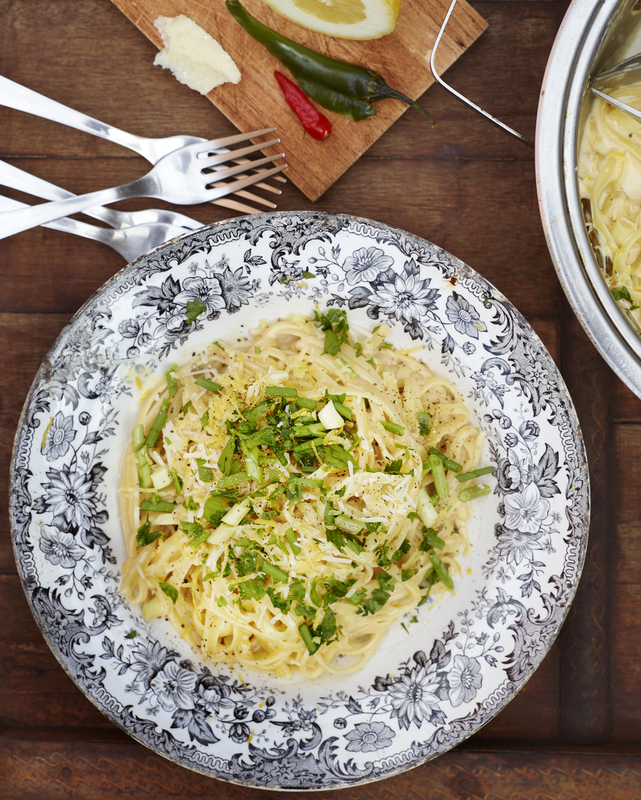 Here is a recipe for a simple and fast weekday pasta. Once water is boiling remove the lid and add the pasta to the water. Stir until all the pasta has descended into the water. Make a note of the amount of time suggested for cooking the pasta on the package and you will want to remove the pasta from the water anywhere from 30 to 60 seconds before the suggested cooking time. If you are tasting the pasta to decide if it has finished you want to remove it at a a slightly firmer texture then al dente. Place a colander into the sink in preparation to drain the pasta when it is cooked. Place your sauce pan over medium heat and add the olive oil. When the oil is hot, saute the spring leek and chili pepper. Once soft add white wine and lemon juice allowing to reduce by half. Next you add the room temperature heavy cream and lower the heat underneath the pan. Add half of a ladle of pasta water to the reducing sauce. Add some salt and white pepper keeping in mind that the grated Parmesan cheese will add salt to the dish as well. In a separate bowl you will whisk the egg yolk with a fork and add a couple tablespoons of the warm cream sauce while whisking. This is to temper the egg yolks so they do not scramble.When the pasta is ready drain in the colander and then add to the cream sauce in the sauce pan. Next stir in the tempered egg yolks, zested lemon, Parmesan cheese and the parsley. This entry was posted in Pasta Recipes and tagged Anna Huerta, lemon, lemon linguine, lemon tree, Pantelleria, Sicily on March 20, 2013 by Anna Huerta. Since I got paid for my time picking with some of this beautiful extra virgin, cold pressed and fruity oil, I made what I have been wanting to try to make for a long time: an olive oil cake. The first recipe I used was a disaster. It tasted too eggy and the olive oil flavor didn’t come through. Only Igor the dog was happy to eat it. The second recipe has good flavor, but it came out too flat. This version was definitely not something you want to see in a photo. The third time is often the charm. It came out perfectly. It was moist and well balanced between the fine flavor of the olive oil and the lemon. Butter and flour a 9 inch ( 24 cm) baking pan. Beat the eggs and sugar until they are light and fluffy, pour in the lemon juice, olive oil and sprinkle the sea salt. Continue whisking for another minute. In another bowl, mix flour, baking powder, lemon zest, pine nuts. Mix the ingredients from both bowls and pour into the baking tin. Bake in the oven for 40-45 min in 350F ( 175C). Use a small saucepan, cook the lemon juice with water and sugar until sugar is melted and fluid is reduced to half. Dry roast the pine nuts in a clean frying pan. Add the lemon zest and the rosemary to the lemon syrup and set it aside to cool down. 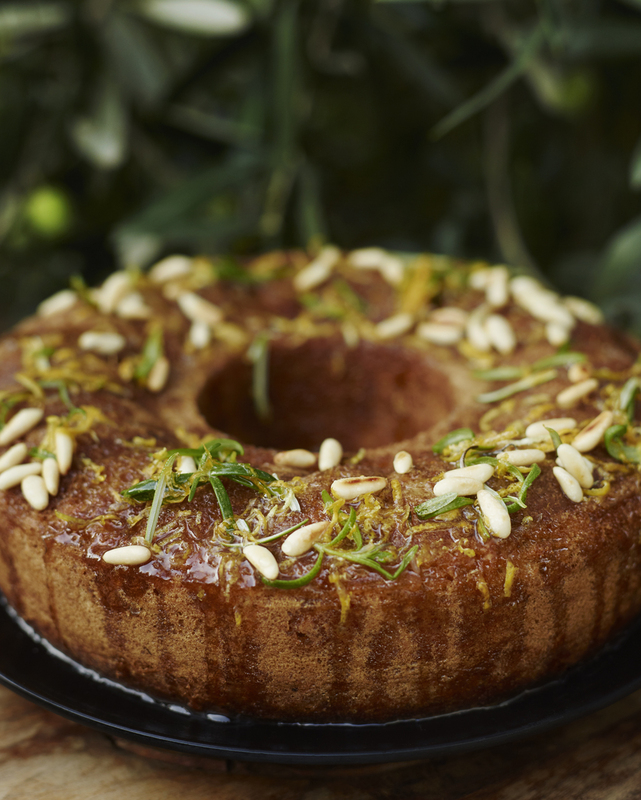 Before serving the cake drizzle the syrup and spread the toasted pine nuts on the top. This entry was posted in Baked Goods Recipes, Dessert Recipes and tagged Anna Huerta, autumn, dessert, dolce, extra virgin olive oil, fall, http://www.annahuerta.com/, lemon, olive oil, Olive oil cake, Pantelleria, Sicily, Under the Almond Tree on November 25, 2012 by Anna Huerta.